Did you know there are 332 million users on LinkedIn and 107 million are in the United States? There are so many potential clients, employees and partners just waiting for you to connect with them. That’s an impressive amount of people on one of the fastest growing social networks, but how can that help your business? Well, for starters LinkedIn is responsible for 64 percent of all visits from social media channels to corporate websites. Facebook is only responsible for 17 percent and Twitter is even lower with 14 percent of all visits. LinkedIn sends nearly four times more people to your website than Twitter and Facebook. It’s time to start increasing your usage on LinkedIn to generate website traffic! 1. Acquire new customers through recommendations. One of the most popular marketing strategies is to get your loyal customers to leave positive reviews for your business online. This same strategy holds true for LinkedIn as well. Dimensional Research reports that positive endorsements influence a purchase decision 88 percent of the time. When it comes to expanding your business, it’s important to leverage your satisfied customers because they are your best source of new customers. The reviews you receive are published on your LinkedIn profile where the entire LinkedIn network can see it. 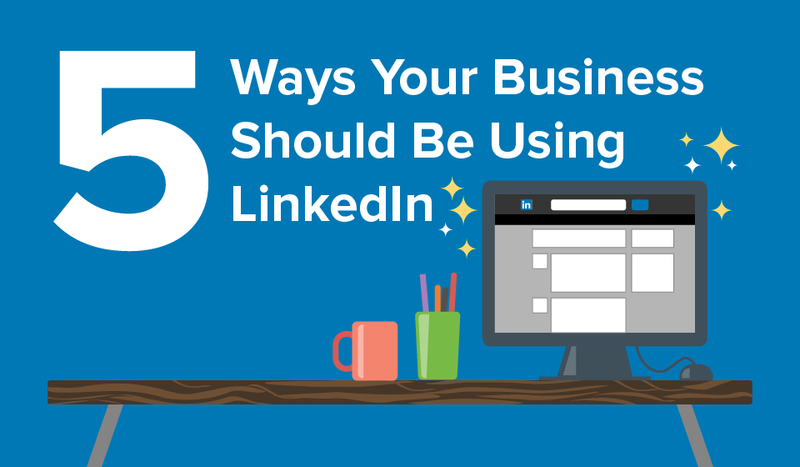 Remember that your LinkedIn page is a tool to validate you and your business. It provides you with credibility to users who don’t already know you. And in the world of business, it’s crucial to earn trust. It will lead to more sales. 2. Build your industry network. A great feature to take advantage of is LinkedIn Groups. There’s an entire directory filled with different industry associations and networks that you can belong to. LinkedIn Groups allow you to find complimentary businesses and peers in your respective industries to network and share referrals with. LinkedIn will also highlight popular local events in your industry that your connections are attending. This tells you what industry events are going on where prospective clients could be attending. 3. Build your credibility with good content. Technorati reports that 31 percent of customers are influenced by blog posts. Don’t be afraid to post the same content throughout all of your social media channels because every channel has a different audience allowing you to reach all of your followers instead of just a fraction of them. Blogging is a very popular. Creating quality content and sharing it with your network will increase your reach. You can take it one step further, by encouraging employees to share content from your corporate page. This will allow you to reach new users who could become clients. 4. Expand your reach by leveraging your employee base. Leverage your employees as brand ambassadors to help share your company's story. Your employees want your business to have success too. By encouraging their engagement (liking, sharing, commenting, etc.) it helps build your brand and increase credibility to others who may view your page. Employees are 70 percent more likely to click, share and comment on an update than a random LinkedIn user. When your employees chose to share items, that information is now being shown to their entire network increasing your reach. You can even create content for your employee base. Take a look at your prior posts to see what performs the best with your employees and create similar content. When people are able to see your work and accomplishments it’s easier for them to deem you credible. You've now added proof to what you say about you and your company. It’s the same concept of getting recommendations. You are constantly trying to add reasons for others to find you credible and deem your work important and worthy of a purchase. Remember, if you tell someone that you’re great and help customers, how do you prove it? Leverage others who are willing to vouch for you. Showcase your work with videos, documents and projects. Create quality blogs that provide users with industry insights and exemplify your expertise. Go to your LinkedIn account now and start leveraging this network today!